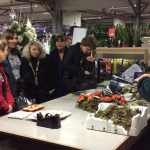 All six of our Hillingdon region branch funeral arrangers, together with District Manager Adrian Moore, attended a floristry demonstration recently at our florists ‘Longacres’ in Shepperton. Margaret the florist, who is responsible for making all Lodge Brothers funeral tributes, gave us her time to give an in depth insight into how floral orders are handled and how the tributes themselves are assembled. The purpose of the evening was for our staff to gain a better understanding of all our floral range and the types of flowers and foliage which are available to us, and how best to advise our clients on colours and the types of flowers.